Time and the elements can leave some parts of your body feeling extremely dry and rough. 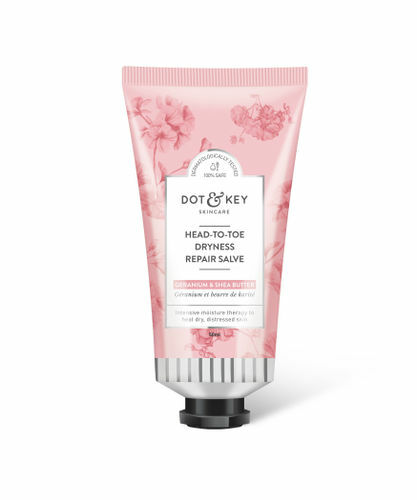 The ceramide-enriched goodness of Dot & Key Head To Toe Dryness Repair Salve offers intense daily nourishment to relieve dry itchiness and white patches. It works to heal dry, distressed skin on all parts of the body. The special formulation of this dry skin cream hydrates skin deeply and supports its moisture barrier with time-release moisture. The naturally derived ceramide and milk lipids it contains improve skin's barrier function and hydration levels. The botanical nourishing complex of shea, argan and lanolin gives your skin the essential hydration it needs, restoring the natural moisture balance and preventing further chapping. It also contains boric acid and vitamin E, which soothe and eliminate roughness, and leave skin softer and smoother, making it a wonderful moisturizer for dry skin. With no nasty chemicals, it is 100% safe and can be used without worries about side-effects. Soak in its rich nourishment while revelling in the refreshing floral fragrance of geranium. Your skin will thank you for it. About the Brand: Dot & Key believes the most overlooked parts of the body deserve as much attention as the face. Therefore, the brand addresses lifestyle needs that are often overlooked by offering you a superior skincare range that's absolutely safe, delightfully gentle and unquestionably effective. Everything they make is clinically tested and cruelty-free, so you can use it without a worry in the world. Explore the entire range of Lotions & Creams available on Nykaa. Shop more Dot & Key products here.You can browse through the complete world of Dot & Key Lotions & Creams .